1. Return, Homecoming : واپس آنا : (noun) a coming to or returning home. Have you returned back from marriage? On his return from Australia we gave him a welcoming party. Arrival - the act of arriving at a certain place. 2. Return, Render : واپس کرنا : (verb) give back. 3. Return, Coming Back : واپس آنا - مخالف سمت میں موڑنا : (noun) the occurrence of a change in direction back in the opposite direction. 4. Return, Regress, Retrovert, Revert, Turn Back : واپس پلٹ آنا : (verb) go back to a previous state. Fall Back, Lapse, Recidivate, Regress, Relapse, Retrogress - go back to bad behavior. 5. Return, Come Back, Hark Back, Recall : واپس ہونا - پہلی صورت حال کی طرف پلٹ جانا : (verb) go back to something earlier. 6. Return, Issue, Payoff, Proceeds, Take, Takings, Yield : منافع - پیداوار : (noun) the income or profit arising from such transactions as the sale of land or other property. The average return was about 5%. Income - the financial gain (earned or unearned) accruing over a given period of time. 7. Return, Bring Back, Take Back : واپس بھیجنا : (verb) bring back to the point of departure. Bring, Convey, Take - take something or somebody with oneself somewhere. 8. Return, Recurrence : دوبارہ ہونا - دوباری آنا : (noun) happening again (especially at regular intervals). 9. Return, Comeback, Counter, Rejoinder, Replication, Retort, Riposte : منہ توڑ جواب : (noun) a quick reply to a question or remark (especially a witty or critical one). Back Talk, Backtalk, Lip, Mouth, Sass, Sassing - an impudent or insolent rejoinder. 10. 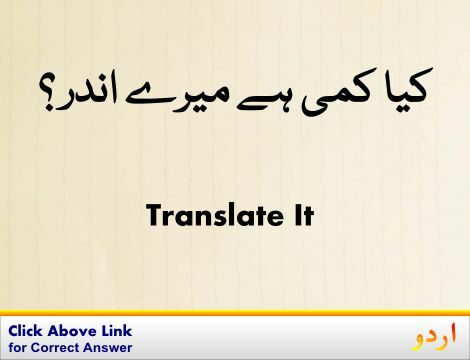 Return, Come Back, Rejoin, Repay, Retort, Riposte : جواب میں دینا - جواب دینا : (verb) answer back. Answer, Reply, Respond - react verbally. 11. Return, Come Back : پہلی حیثیت حاصل کرنا : (verb) be restored. Re-Emerge, Reappear - appear again. 12. Return, Give Back, Refund, Repay : رقم واپس دینا - واپس ادا کرنا : (verb) pay back. Pay - bear (a cost or penalty), in recompense for some action. 13. Return, Deliver, Render : دینا : (verb) pass down. Communicate, Pass, Pass Along, Pass On, Put Across - transmit information ahead. 14. Return, Reelect : دوبارہ منتخب ہونا : (verb) elect again. Elect - select by a vote for an office or membership. 15. 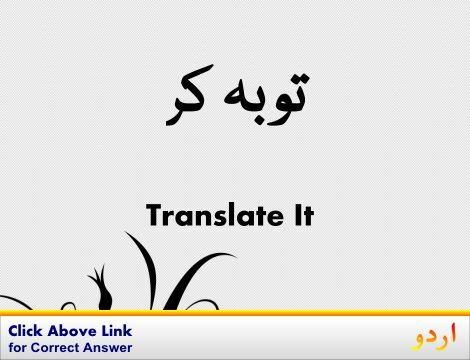 Return, Devolve, Fall, Pass : سپرد ہونا - وراثتاً پہنچانا : (verb) be inherited by. The land returned to the family. Accrue, Fall - come into the possession of. 16. Return, Generate, Give, Render, Yield : دینا : (verb) give or supply. Create, Make, Produce - create or manufacture a man-made product. Back, Backrest : کمر پشتہ : a support that you can lean against while sitting. "The back of the dental chair was adjustable"
Advent, Coming : آمد : arrival that has been awaited (especially of something momentous). "The advent of the computer"
Give, Spring, Springiness : لچک : the elasticity of something that can be stretched and returns to its original length. Abode, Domicile, Dwelling, Dwelling House, Habitation, Home : گھر : housing that someone is living in. "I am about to arrive home"
Return Ticket : آنے جانے کا ٹکٹ : a ticket to a place and back (usually over the same route). Retrorse : پیچھے کو مڑا ہوا : bent or curved backward or downward. How this page explains Return ? It helps you understand the word Return with comprehensive detail, no other web page in our knowledge can explain Return better than this page. 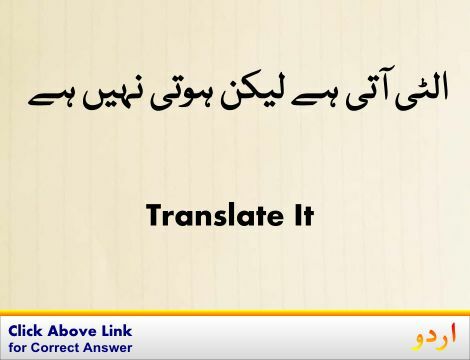 The page not only provides Urdu meaning of Return but also gives extensive definition in English language. The definition of Return is followed by practically usable example sentences which allow you to construct you own sentences based on it. You can also find multiple synonyms or similar words on the right of Return. All of this may seem less if you are unable to learn exact pronunciation of Return, so we have embedded mp3 recording of native Englishman, simply click on speaker icon and listen how English speaking people pronounce Return. We hope this page has helped you understand Return in detail, if you find any mistake on this page, please keep in mind that no human being can be perfect.